By default the first cell of a row represents row indicator, which appears when the row is set as current. To hide the row indicator set the RowIndicatorVisibility property to Collapsed. 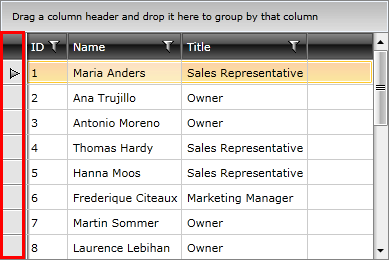 RadGridView allows you to easily customize each of the row types by just assigning a style to it. To style rows or alternating rows you can use the RowStyle or the AlternateRowStyle properties. To learn how to do this take a look at the Styling Rows topic. To style the group row you can use the GroupRowStyle property. To learn how to do this take a look at the Styling Group Row topic. To style the header row you can use the HeaderRowStyle property. 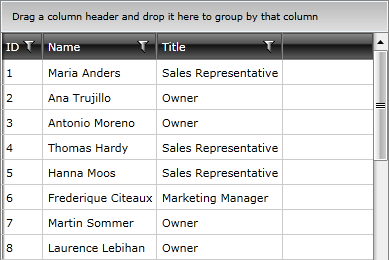 To learn how to do this take a look at the Styling Header Row topic.